Under the new world order that believes that social media is the best place to look into to analyze engagement with content, the recently concluded ASAP Live in Sydney is a runaway winner. All one needs to do is type those very words on YouTube, Instagram, Twitter and Facebook and user-generated posts collectively amounting to millions of views and tens of thousands of shares come popping out. To those who don’t bother with social media, a simple photo of what transpired at ICC Sydney Theatre on Oct. 20 speaks volumes. But ASAP Live in Sydney-made possible by fans, sponsors and partners who believe in the longest-running Filipino weekend variety TV show and global live concert tour of ABS-CBN, and its current international flagship channel, TFC—is so much more than just a numbers game. ASAP Live in Sydney—in the same way that ASAP Live was in Singapore, Dubai, Los Angeles, London, New York, Toronto and Honolulu – is a creative and artistic expression and manifestation of a strong Filipino identity and transnational cultural unity. It’s about Filipinos without borders, gathering to celebrate a common place of origin or roots while celebrating where they presently are. And in a world-class spectacle of song, dance, talk and multimedia, performers and audience happily tell themselves about themselves: it’s Filipinos telling Filipinos about Filipinos outside of the Philippines. For instance, the press conference held on Oct. 18 also at ICC Sydney Theatre was virtually a group of Filipino and Fil-Australian strangers bound together only by the fact that they are either members or viewers of ASAP Live. But it turned out to be a respectful, loving, animated, funny, learning and intimate interaction of close to 200 people in a room. Add to that thousands more via Facebook livestream. The creative minds of ASAP Live Business Unit Head Joyce Liquicia and her team produced back-to-back concerts in one show that integrated the Filipino in the blended cultural universes of the Philippines and Australia. Opening the first concert with the Walangari Karintawarra and Diramu aboriginal dance and didgeridoo music of the host country then segueing to Bamboo and Daniel Padilla, with the G-Force dancers, singing, “Hoy, Pinoy Ako (Hey, I’m Filipino)” from Bamboo’s classic hit, “NoyPi” was a testament to staying uniquely Filipino even while living in and embracing a new land. It was a theme that would weave throughout the evening. Then as a trademark of ASAP Live shows, there was a stream of exuberant and intricate pop song and dance numbers that represented energy, positivity and fun with a touch of both modern and nostalgic. There are showstoppers that included ASAP mainstays with the following special guests that elevated even further the overall artistry of the show: Yassi Pressman, Miss Universe 2015 Pia Wurtzbach, Paulo Avelino, Cristine Reyes, Ariel Rivera, Randy Santiago, 2014 The X-Factor Australia winner Marlisa Punzalan and Regine Velasquez-Alcasid who had announced her transfer to the ABS-CBN Kapamilya network prior to flying to ASAP Live in Sydney. “It amazes me that ‘ASAP Live’ continues to grow, evolve and win new audiences thousands of miles across the globe. It remains relevant to today’s Filipino diasporans living in multicultural societies. We in ABS-CBN Australia are very thankful for the opportunity via ‘ASAP Live in Sydney’ to collaborate with the entire ABS-CBN and TFC teams and partners to bring this huge, bright light of Filipino pride to thousands here in Australia who welcomed the show with open arms. It’s been a challenging but entirely fulfilling and heartwarming ride. We’ve been blessed,” said ABS-CBN Australia Country Manager Jay Santos. 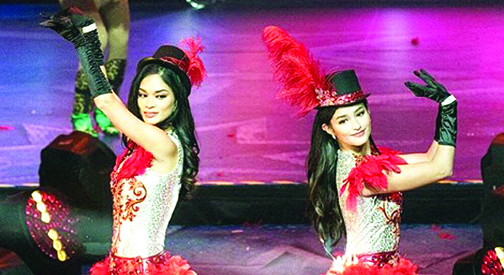 There is much more to see in ASAP Live in Sydney in its telecasts or online. Catch ASAP Live in Sydney this Sunday only on ABS-CBN TFC worldwide.